WISEdecision is the end user presentation tool set that gives you the final product. Where you make your decision behind WISEware's web-based, easy-to-use, end user reporting tool. Collect data from your internal systems, prepare it for analysis, develop and run queries against the data, and create reports, dashboards and data visualizations so you have the information you need, when you need it.All three elements are designed to work together to help you create insightful ad hoc reports when you need to find instant answers to specific business questions without waiting on an IT response. 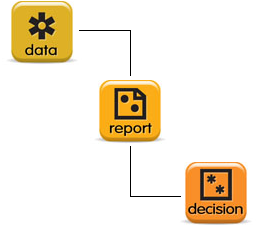 WISEdecision is a web-based data presentation tool that permits end-users to display reports defined using WISEreport. Reports can be scheduled to run and exported to Microsoft Excel, text, or XML files. Users can define favorite reports and share reports with other WISEdecision users. Your reports can be scheduled for delivery by e-mail to your co-workers and business contacts. Plus, you can export reports to a specific location or uploaded to an FTP server. WISEdecision and WISEware's ad hoc reporting solution does not charge per-user fees. If the benefit of ad hoc reporting is that of empowering end-users, it should not come with a user-tax in the form of per-seat licensing. Depending on your needs a WISEdata, WISEreport and WISEdecision solution can be tailored to meet your business and financial requirements. For more information on how to have WISEdecision working for your organization, contact WISEware.